This week the 2017 FEI European Senior Vaulting Championships get underway in Ebreichsdorf, Austria. 13 nations will battle it out for the 4 titles on offer in the Individual Female, Individual Male, Pas de Deux & Team competition. There has been an unbelievably high calibre of vaulting throughout this season with no one vaulter emerging as favourite. With classes packed full of previous medal winners and World Cup Champions - the gold medal is there for anyone to take. Can Jannis Drewell retain his title? There will be a new FEI European Champion crowned in the female individual class following the retirement of current champion Simone Jäiser . Italy’s Anna Cavallaro will be looking to continue her current form which won her the FEI World Cup in Dortmund in March. Anna will be looking to challenge for her first European title after previously finishing runner-up at the 2013 European Championships. She will face extremely tough competition from the German contingent which includes 2016 World silver medallist Kristina Boe, this year’s CHIO Aachen winner Janika Derks & previous European silver medallist Sarah Kay. Whilst the women from Austria & Switzerland could easily present a challenge. Can he keep his title? Defending Champion Jannis Drewell will be hoping to re-create his emphatic win from Aachen two years ago. The showman will face a tough contest from his fellow German countrymen Thomas Brüsewitz & Erik Oese. This year could see a repeat of the 2015 European championship where Thomas Brüsewitz narrowly came 2nd to Jannis. Can he go one better? Whilst Erik Oese is a multi-world & European medallist can he get the one medal that has evaded him, gold? Frenchmen Clement Taillez & World silver medallist Vincent Haennel could ruin the party for the German men. This week it was announced that favourites and reigning Pas de Deux champions Jasmin Lindner & Lukas Wacha had withdrawn from the competition as Lukas suffered an injury. Together this pairing have been wowing vaulting audiences with their Pas de deux for the past 7 years. Winning their first Pas de deux title in 2012 and proving unbeatable at every World & European championship since with their ability to perform perfect performances with unmatched storytelling under the highest of pressure. They have treated us to unforgettable themes such as Siegfried & Roy, ‘Hearts a Mess’ and last year’s show stopping Nostradamus freestyle. Whilst this year’s highly competitive Pas de Deux class could have proved the toughest test for Jasmin & Lukas yet. After finishing 4th and narrowly missing out on a medal at last year’s World Championship Italy’s Silvia Stopazzini & Lorenzo Lupacchini have been dominating the Pas de Deux class taking the FEI World Cup title at the start of the year. The CHIO in Aachen saw them debut a new high-energy Latin inspired routine captivating crowds with their precision and flare – they won Aachen in a highly competitive class. The championship could see a repeat of the World Cup final with the Italian pairing going head to head with Theresa-Sophie Bresch & Torben Jacobs (GER) who together were the 2011 European Pas de Deux Champions. The young pairing of Timo Gerdes & Jolina Ossenberg-Engels (GER) have had a vast improvement throughout this year’s season making a name for themselves as firm medal contenders. Whilst Theresa Thiel & Stefan Csandl now carry the hopes of the home nation and have all the experience & attributes to challenge for the title. The prestigious team competition looks to come down to a battle between vaulting heavy weights Germany, Switzerland & Austria. This will be the first time Team Norka from the JRG Koln have represented Germany since the 1999 European Championships. 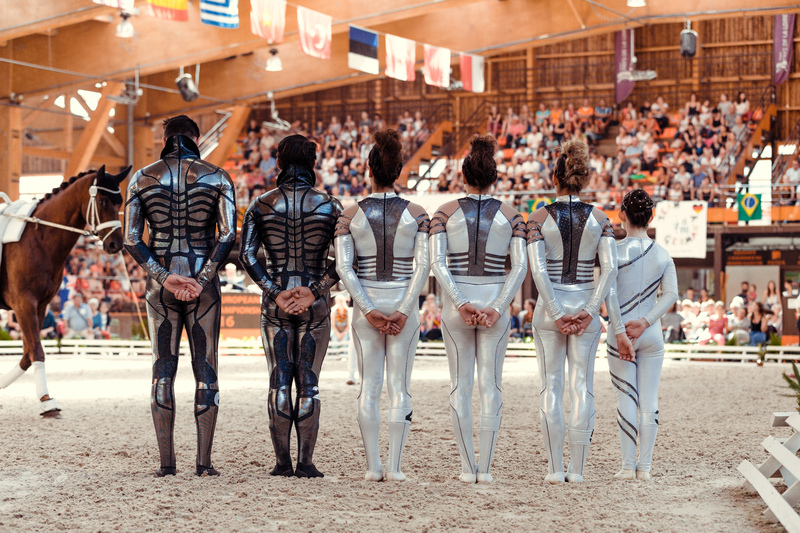 Their team is packed full of previous Pas De Deux & Individual medallists and alongside Danny Boy and 2010 World Equestrian Games Champion Patric Looser on the lunge, they will firmly have their eyes set on the gold medal. They will face a tough challenge from Austria who will be looking to take the title in front of their home crowd and have a freestyle full of show-stopping moves. Switzerland have experienced an incredible year so far in their first season together with horse Rayo de La Luz, while France & Italy could also challenge for the medals. In this extremely tight team competition there will be no margin for error.